When Christopher Walz asked about a review I looked at his publications on DMs Guild and I quickly focused on The Call of Atropus. I didn’t exactly judge it by its cover but I was wondering if—hoping that—it was a nod to the Cthulhu Mythos. And lo, it was indeed a nod to the Great Old Ones! Target acquired. First things first, to run this adventure you’ll need a few things beyond the obvious (such as the core books and dice). 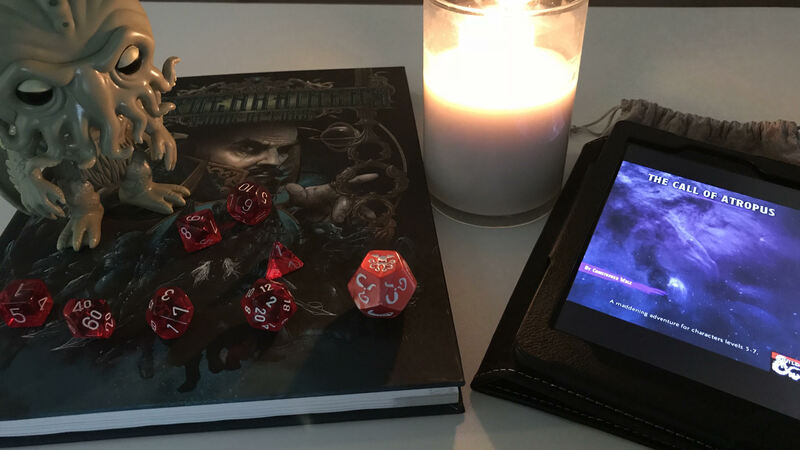 You’ll need 4-6 friends of 5th-7th level and you’ll want Mordenkainen’s Tome of Foes. You don’t have to be familiar with H.P. Lovecraft to enjoy this adventure. However, familiarity wouldn’t hurt. Furthermore, it is not necessary to be well-versed in Realmspace or the larger Spelljammer campaign setting. But if you like space fantasy. Go check out Spelljammer sometime (check out this article from Phil at powerwordskill.com [there’s an accompanying 5E PDF you can download for free]) as this adventure makes for a good launching point for a space campaign. Aside from that, settle in and prepare for some madness. It’s been 256 years since the red comet, Phoenix, has streaked across a Torilian sky but the sages are expecting its return. It is, after all, the Year of the Phoenix. Strange and dark things across the land are awakening from their deep sleeps. Presumably, they are answering the call of Atropus. What few, if any, realize is the comet is actually a piece of Atropus, an undead Dawn Titan. It seems the Elder Evil is coming back around again. Some 700 years ago an astronomer was studying the movement of the stars. Erdanis Felahil was not only an astronomer but also a wizard and his scholarly disposition drove his curiosity and his desire to share his knowledge. But it also ultimately proved to be his undoing. In his arcane research, he learned to peer back in time. Not just moments past or even years. But he learned to look back eons into the past. And when he did, it drove him insane and his body was shattered. He returned in his afterlife as an allip. 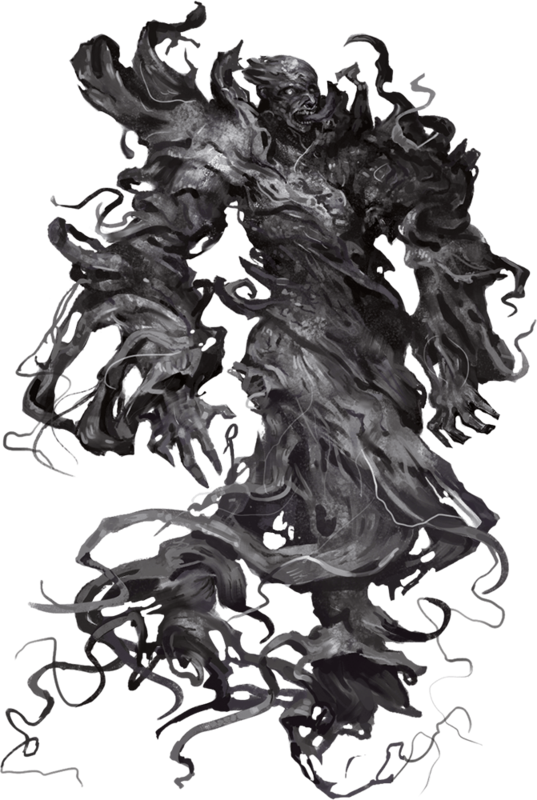 An allip, according to Mordenkainen’s Tome of Foes (MToF), is an undead creature that is “wracked with a horrifying insight”. The allip will do its best to relieve itself of this insight by imparting its knowledge on other creatures that are nearby. So, as you can see, Erdanis still has knowledge he’s just dying to share. But what on Toril would ever drive your PCs to get anywhere near Erdanis’s observatory in the Cloud Peaks? Valathuriel Selevarun is a researcher from Candlekeep. She is ambitious and a bit naïve. She hired a dwarven duo to accompany her to Erdanis’s ruins and three of them have not been heard from in a month. It is up to the heroes to investigate their disappearance and, hopefully, return Valathuriel and the dwarves, Hammer and Anvil, safely to Candlekeep. Well all right then. Chris does provide some really great hooks for this adventure. I’ll summarize them below. Lost Researcher: Monks in Candlekeep have offered a substantial reward for information about Valathuriel. Servant of Evil: An ousted warlock has left behind clues about the abandoned observatory. Strange Signs: Amnian caravans have reports of strange lights in the Cloud Peaks footfills as well as temporary nightmares for any who make camp nearby. Unnatural Game: A ranger of the Emerald Enclave was investigating unrecognizable tracks and discovered a pack of star spawn and is eager to learn more about the aliens. From this point onward I should be a bit more circumspect lest I giveaway the farm. Aside from including elements of the Cthulhu Mythos from MToF in The Call of Atropus, Chris has done a great job of giving the DM a nice challenge of describing a thematic crawl without spoon-feeding you a lot of narrative. You’ll create that on your own. This is not an adventure you want to skim through and then just start running it. Getting to the observatory is simple. Getting through it will be the challenge. These encounters are deadly. You’ve heard that only fools rush in, yeah? I dare your PCs to just charge headlong into Erdanis’s tower. Be foolhardy and every eldritch horror within the tower is likely to descend upon them en masse. Does this mean they need a party full of rogues? Not necessarily. But if they have a paladin in half plate armor whose ego is higher than his dexterity…they’ll want to make sure he’s kept in check. They need him. They’ll all need to be bold. But they must be smart too. To conduct a great story that is in keeping with the theme you’d do well to remember that Cthulhu stories are all about madness. When it comes to The Call of Atropus, D&D stands for Discord & Dissonance. Use these two elements as you would a monster from a given compendium. Share information, if practical, with only a single player and let her roleplay accordingly while the rest of the PCs react. But maintain suspense. Build the mystery and the tension. And let them release that tension when they have to. As I stated before, this is not your typical hack-slash adventure. Every encounter in this module could be the PC’s last. Therefore, it is important that they gain the upper hand as much as possible. In Episode IV, Obi Wan Kenobi told Han Solo “there are alternatives to fighting”. The PCs should keep their options open and remember that discretion is the better part of valor. If a foe retreats it may be a good idea to let it. But it may also mean it’s going to alert the whole tower or find a shadow in which it can lurk and get the jump on the group later. Be vigilant! Flank. Dodge. Dash. Disengage. Intellect. These will be as important as weapons, armor, and spell components. Thanks. It does. Gotta get that updated.